Note: If you are in the habit of showing up at the door and requesting extra days on your badge, be advised that the higher walk-on rates will apply. Increased door rates are imposed to encourage pre-registration and avoid badge reprints which slow the registration process for yourself and others. So, if you want to upgrade your membership to include pre-cons, do so now before Pre-Registration ends on June 30. TEAM TOURNAMENT UNDER NEW MANAGEMENT: Stuart Tucker, the Happy Handicapper, has stepped down and passed the Odds baton to Jeff Cornett for a renewed challenge that relies more heavily on past statistics. Stuart will remain active from the cheap seats, critiquing the odds and pointing out the over- and under-rated based on his years at the track. Can you beat the new Handicapper this year? Note that team registration is also affected by the earlier deadline for WBC pre-registration. If you're not pre-registered by June 30, you can't be on a team. The first horses are already headed to the starting gate for the 24th annual run for the slivers. Get your team entered and study the racing form for our annual Bracket Busting contest. Don't procrastinate! Enter your team now by mailing in your pre-reg form or simply sending an email to conventiondirector@boardgamers.org. MOBILE APPS DEBUT: Kevin Broh-Kahn's WBC Schedule is now available for Android in the Google Play Store and for Apple devices at iTunes. It features offline storage of the schedule (app does not require internet connection after download), views of entire schedule by day, hour and tournament, personalized schedule, hotel maps, and more. Both apps are currently being updated. Please give feedback and watch for updates. WBC PROGRAM ON LINE: A colorized version of the 2014 program containing the complete alphabetical and chronological schedule is now posted on line. Unlike the black & white print version distributed at WBC, the various categories of events are color coded as an aid to quick recognition and is definitely worth downloading and printing for the easiest reference. It can be found at http://boardgamers.org. View the details of your favorite events and then plan your schedule using Steve Okonski's Personal Scheduler. You can also find additional scheduling aids on line for the ultimate in planning your week at WBC. Upcoming additions include an iOS App and i calendar format. 2013-2014 YEARBOOK: The most recent version of the WBC Yearbook is posted online. Qualifying members who renewed their Sustaining or Tribune memberships by the required deadline and who were not mailed a copy may pick up theirs at WBC registration in New Holland. A limited number of additional copies will be available for sale on site for $10. AUCTION CLOSED: The Auction again sold out in record time this year. Those contemplating selling items now need to wait till next year or avail themselves of the Auction Store. All Auction Store items must be pre-registered. The Auction Store is also capping what it will accept this year at 2200 items so don't delay. Unregistered items will NOT be accepted. Get the details on the Auction Overiew page. WBC...THE BOARD GAME: New games come and go with the regularity of the seasons, but one recently debuted on the GMT P500 list which made us sit up and take notice as two of our own WBC stalwarts—Bryan Collars and Josh Githens—have ventured into the realm of game design with a subject near and dear to our hearts. BPA is pleased to acknowledge their progress with a special shout out to all our attendees to check out this new product. The six turns each represent a day at the convention. Players must manage their time while contesting events in a quest for laurels amidst a flurry of event cards with a familiar (and, dare I say, humorous) ring. By ordering early you not only get the discounted P500 price but the opportunity to see yourself immortalized in a game card. Avail yourself of the opportunity to experience the game at WBC in one of its three official demos this summer. For those who are wondering, BPA has no stake in the game and no commercial interest thereto although its mere existence may serve as a portal to introduce others to the WBC experience. But if in some distant future year you are unfortunate enough to be among the missing, at least you can pull out the game at home and experience WBC all over again in spirit. Get all the details at http://www.gmtgames.com/p-495-wbc-the-board-game.aspx. May its P500 numbers grow high and fast. REGISTRATION PAGE OPENED: WBC's Pre-Registration is setting a record pace, with nearly 900 attendee commitments already logged in, but it all comes to a crashing halt on July 1, so don't delay. Any registration received after June 30 will be charged the higher rates. Use page to check the status of your registration, troll for teammates, rides or roommates, or even Open Gaming matches or baby sitting gigs. Send your requests to acd@boardgamers.org. LIBRARY INVENTORY UPDATE: Donations of new games are again pouring into the BPA Game Library sponsored by Alliance Distributors. The center piece of the Lancaster Showroom's 13,000 sq ft Open Gaming Dinner Theatre made over 1800 recorded game loans last time and an even bigger assortment of the latest games is expected in 2014. See the continually updated 2014 inventory as it grows ever larger. OPEN GAMING EXPANDS: The Showroom's 13,000 sq ft Open Gaming location remains the focal point of the convention and will be supplemented by the even larger Expo Center during peak days, Wednesday thru Saturday. While the Expo Center is without library services and rectangular tables, it will not be subject to parking tickets and may be a better choice for games with long setup times whose players need to take occasional breaks. However, unattended games remain so at your own risk. Note once again that there is no Open Gaming during the Pre-Cons. More details are available on the Open Gaming page. LODGING: Although the Host is long since sold out, overflow housing is available across the street at the Continental Inn for $99 per day including a free, hot breakfast. A three-night minimum stay is required for our special group rate. One night's deposit will be required upon booking. Deposit is refundable up until 48 hours prior to arrival. Phone 717-299-0421 to make your reservation or email info@continentalInn.com for a callback by the reservationist. Alternatively, you may book online at http://www.continentalinn.com for the regular rates and identify yourself in the comments as claiming the WBC rate, providing you are booking the three-night minimum stay. This offer is valid until July 1, 2014, or our room block sells out, whichever occurs first. 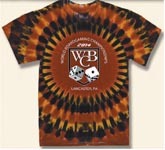 TIE-DYE SPECIAL ORDERS BACK AGAIN: A wide assortment of WBC Souvenirs and apparel, most with the BPA embroidered logo, is now available to order for pickup at WBC. Review the offerings on the Souvenirs page. WBC 2014 EVENT PREVIEWS: Each of our 159 tournaments are previewed in detail as only WBC does them in our Previews section. POLLS CLOSE July 15: Only a month remains to vote for three members to three-year terms on the BPA Board of Directors. This year's election features two incumbents and two past Board members vying for three seats. Cast your vote to determine the odd man out. Get all the information on the 2014 Election page. As usual, voting is effortless and takes only a moment thanks to the electronic ballot. All members (any paid attendee of WBC for more than one day is considered a member) are urged to vote since validation requires sufficient membership participation. KIRCHER WINS MARCH MADNESS: Rob Kircher earned his first MMS laurels in style by besting the 44-player field to win the 10th Annual March Madness PBeM tournament . Robert’s 12th-seeded Auburn 1999 team had a narrow 2-point victory in his first game, an 84-82 win over Dennis Nicholson’s Arizona 1997 squad. After an easier 74-59 win over Bob Hamel’s Kansas 1988 team, Robert survived another 2-point squeaker, 71-69, over Pete Stein’s Arkansas 1994 squad. Robert suffered less stress after that, beating Robert Rund (UCLA 1970) 108-97, Derek Landel (North Carolina 1998) 89-62 and Max Jamelli (San Francisco 1956) 70-57. Israeli Aran Warszawski's 35th-seeded Oklahoma State 2005 team was the final hurdle and it came down to the last die roll before Robert emerged with a 63-56 win. Other laurelists included Max Jamelli (also earning his first MMS laurels), Sean McCulloch, Derek Landel and Jeremy Billones. Updated laurel totals and more details of the 87-game tournament are available at on the March Madness AAR page. WOJTASZCZYK LEADS PRO GOLF: Round 2 has finished with the cut line established at 2 under par, sending all but 17 duffers home. Laurie, not Keith, Wojtaszczyk is our leader in the clubhouse at 12 under par as the Junior monitor swings a mean stick. Must be all that practice keeping Juniors in line. Basketball champ Robert Kircher is in hot pursuit just one stroke back as he enters Amen Corner. Meanwhile, Pete Stein who was looking like a contender, but his 4 over par after just six holes at Augusta has him 7 strokes off the pace. I guess he won't be borrowing Yoshi's green jacket this year after all. See http://www.nktelco.net/bdmonnin/PBeM_Scoresheet.htm to follow the action. ADEL VERPFLICHTET ENTERS ELIMINATION ROUNDS: The preliminary rounds and 30 games of the Adel Verpflichtet/Hoity Toity tournament have ended! Excluding Tom DeMarco, it wasn’t a good year to be a former champion. But Tom proved to be the exception to the rule, as he battles Suzanne Tuch and Bob Hamel for the lead in the playoffs. You can see all of the standings at http://www.gameaholics.com/adv_tournament.htm. ADVANCED CIVILIZATION DUAL PROGRESS REPORTS: The 2013 Final is in the trade portion of Round 14. Our international contingent holds the top three spots in the point totals, with Jonas Lundgvist (Babylon) at 2873, Mads Lunau (Thrace) at 2827, and Javier de la Fuente at 2800. Africa, Asia, Iberia, Illyria, and Assyria all trail behind. With at least three turns remaining, there is still plenty of time for things to change. Meanwhile, we are still in the preliminary games for the 2014 tournament with all games between Rounds 9 and 14. At the time of this writing, the current leaders include Javier de la Fuente (tops in both games he is playing), Fredrick Carlsson, Shantanu Saha (also winning both games he is playing), Joe Lux, Jon Anderson, Bryan Metrish, and Kevin Youells (another two-game leader). WASHINGTON’S WAR: The Championship Round has started for the 4th BPA WTP/WWR tournament and should finish before WBC. Playing for the title are Dan Leader, who is undefeated, and Dave Rubin, who lost in Round 1. Leader advanced by beating James Pei in the Semifinals as the Americans in a very close game that came down to the last few cards and ended in 1780. Rubin defeated Trevor Bender in the Semis as the Brits in a rare autovictory in 1777. Pei and Bender will play a consolation game for 3rd place honors.